CBRE Spain designed the new headquarters for a leading international law firm located in Madrid, Spain. The headquarters, in the heart of the financial center of the capital, are located in the same building where the firm was already established: the building also entirely renovated by the landlord in parallel with the fit-out of the new legal headquarters. The firm focused on providing their employees with the right space to work, and sought to reflect in the offices an image of elegance, confidence, and transparency. CBRE Spain responded to this brief by creating a unique environment full of natural light, where a variety of working spaces are provided. Among these, the office has focus areas, spaces for more collaborative work, and of course meeting rooms. The private legal offices are located along the façade ensuring that they make the most of the natural light and city views. Collaboration and informal areas are placed at the corners of the floor plate, in order for them to be easily reached by all employees and act as a kind of hub for good team communication. 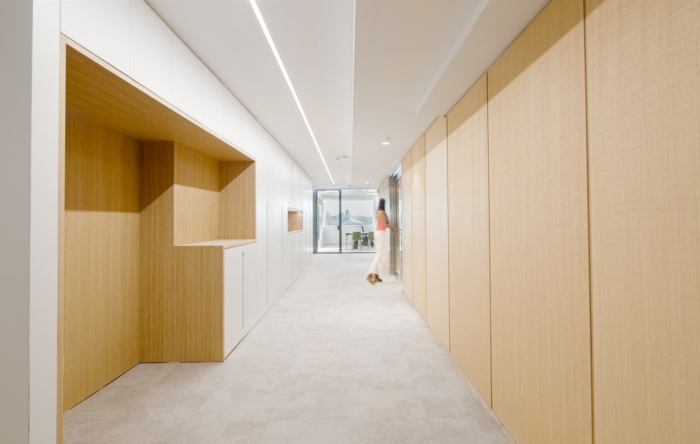 The legal offices have a more conventional design using clean, orthogonal lines in their design, while meeting rooms, placed in the center of the space, are configured using curves. The choice of materials, palette colors, and design patterns is decisive in creating the impeccable image the firm was looking for. We chose a mood-board that provided an appropriate environment for lawyers to work in, at the same time broadening the perception of what a legal office could be.